Leah Patricio simgs ‘Muli’ with Jed Madela as her first piece in the Finals of The Voice of the Philippines Season 2 in the Resorts World Manila on February 28, 2015. Her journey is about to close, is she the one destined to be the grand winner? For the finals, only the public votes will decide who wins the grand title. There will be four set of performances and the first will be a duet with a chosen artist. This time, only one vote per SIM will be counted in each set of performance. After tallying of votes, only two will survive. Vote standing will go back to zero as the Top 2 goes head to head and ultimately only one bring home the Grand Title as The Voice of the Philippines. The first set of performances will be duets with a professional artist. Dubbed as the ‘Diva ng Tondo’, Lea Patricio recounted that she had gone in so many places just to join a lot of competitions. Her best moments in her journey are seeing Sarah and Lea turning for her in the Blinds Audition, hugging Lea, her idol, for then first time, losing her fear in the competition and being one of the Top 4 who gets to the Final Showdown. Leah sings with Jed Madela in the performance of ‘Muli’. Sarah said that it was a very beautiful piece. She had shared that Leah must continue her singing even after the competition as the music industry needs her. She is an artists that could be idolized by the viewers. Bamboo said that the performance and emotion had been very intense. 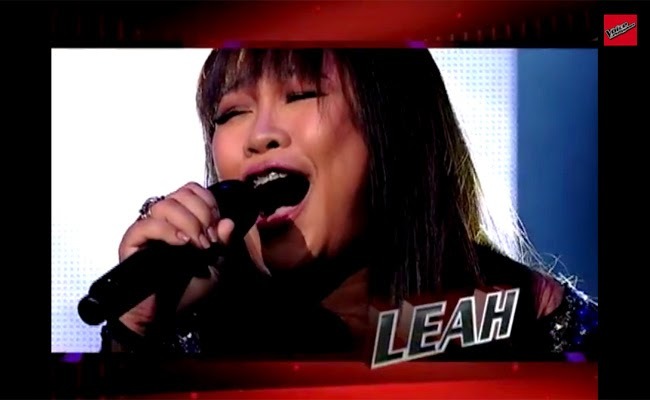 Does Leah have what it takes to be the next The Voice? You have the power to decide.